The importance of the mitochondrial amidoxime reducing component (mARC)–containing enzyme system in N-reductive metabolism has been studied extensively. It catalyzes the reduction of various N-hydroxylated compounds and therefore acts as the counterpart of cytochrome P450– and flavin-containing monooxygenase–catalyzed oxidations at nitrogen centers. This enzyme system was found to be responsible for the activation of amidoxime and N-hydroxyguanidine prodrugs in drug metabolism. The synergy of three components (mARC, cytochrome b5, and the appropriate reductase) is crucial to exert the N-reductive catalytic effect. Previous studies have demonstrated the involvement of the specific isoforms of the molybdoenzyme mARC and the electron transport protein cytochrome b5 in N-reductive metabolism. To date, the corresponding reductase involved in N-reductive metabolism has yet to be defined because previous investigations have presented ambiguous results. Using small interfering RNA–mediated knockdown in human cells and assessing the stoichiometry of the enzyme system reconstituted in vitro, we provide evidence that NADH–cytochrome-b5 reductase 3 is the principal reductase involved in the mARC enzyme system and is an essential component of N-reductive metabolism in human cells. In addition, only minimal levels of cytochrome-b5 reductase 3 protein are sufficient for catalysis, which impeded previous attempts to identify the reductase. Previous studies investigating the activation of N-hydroxyamidine (amidoxime) prodrugs led to the discovery of the molybdoprotein mitochondrial amidoxime reducing component (mARC) in 2006 (Havemeyer et al., 2006). The N-reductive enzyme system catalyzes the reduction of various N-hydroxylated compounds, including amidoximes, N-hydroxyguanidines, hydroxylamines, sulfhydroxamic acids, oximes, and N-oxides to the corresponding amines (Havemeyer et al., 2011; Jakobs et al., 2014). As the reductive counterpart to the cytochrome P450– and flavin-containing monooxygenase–catalyzed oxidations at nitrogen centers, this system plays an important role in N-reductive metabolism and has been shown to be responsible for the activation of amidoxime and N-hydroxyguanidine prodrugs. Although its physiologic substrates, and therefore its physiologic functions, are largely unknown, the N-reductive system is assumed to be involved in detoxification of mutagenic and toxic aromatic hydroxylamines and regulation of the l-arginine–dependent biosynthesis of nitric oxide (Kotthaus et al., 2011; Plitzko et al., 2015). Studies have also suggested that the mARC system plays an important role in lipid synthesis (Neve et al., 2012). Activity and purification studies revealed localization of the N-reductive system in the outer mitochondrial membrane (OMM) (Havemeyer et al., 2006; Klein et al., 2012). Three components are required for N-reductive catalysis: mARC and the two electron transport proteins cytochrome b5 (CYB5) and the corresponding reductase. All mammalian genomes contain two mARC genes, mARC1 and mARC2, which share high sequence similarity. Both mARC proteins have been shown to catalyze N-reduction in vitro and in cellular metabolism (Gruenewald et al., 2008; Plitzko et al., 2013). The involvement of the specific mARC isoform in cellular metabolism is highly dependent on its expression level, which varies tremendously between species (Plitzko et al., 2013). For the second component of N-reductive catalysis (CYB5), it was demonstrated that only the mitochondrial isoform CYB5B is required for the N-reductive system in cells, whereas involvement of the microsomal CYB5A could be excluded (Plitzko et al., 2013). To date, studies to define the third component of N-reduction, the corresponding reductase of the enzyme system, have presented ambiguous results. NADH–cytochrome-b5 reductase (CYB5R) is a flavoprotein reductase that mediates electron transfer from the two-electron donator NADH to the one-electron acceptor CYB5. The human genome harbors four CYB5R genes (CYB5R1–CYB5R4). CYB5R1 and CYB5R2 are membrane proteins, the subcellular localization and specific functions of which remain unknown, although one study described a mitochondrial localization of CYB5R1 (Zhao et al., 2011). CYB5R4 is a soluble protein that carries both heme binding and FAD binding domains and is found in the lumen of the endoplasmic reticulum (Zhu et al., 2004). The functions and locations of CYB5R3 have been studied to a much greater extent, and expression profiles show that CYB5R3 is far more prevalent in human tissues than the other isoforms (Wu et al., 2009). The CYB5R3 gene encodes two isoforms. Isoform 1 is a membrane protein and can be found in both the OMM and the endoplasmic reticulum. Unlike the proteins of CYB5, the microsomal and the mitochondrial proteins of CYB5R3 are therefore molecularly identical. Isoform 2 is a soluble splicing variant, solely lacking the membrane anchor domain present in isoform 1, and is found in erythrocytes (Borgese et al., 1993). In vitro, the recombinant N-reductive system can be reconstituted using soluble CYB5R3 and truncated forms of mARC and CYB5B. This system has been effectively employed to conduct in vitro N-reductive biotransformation studies to evaluate and estimate the extent of N-reductive metabolism of many N-hydroxylated prodrug and drug candidates (Gruenewald et al., 2008; Havemeyer et al., 2010; Froriep et al., 2013; Ott et al., 2014). Despite its functionality in vitro, the role of CYB5R3 as the reductase of N-reductive metabolism in living cell systems remains to be defined. Neve et al. (2012) were unable to confirm the involvement of CYB5R3, CYB5R1, or CYB5R2 in N-reductive metabolism using RNA interference (RNAi) in murine adipocytes or via inhibition studies in subcellular fractions. They concluded that CYB5R is not the corresponding reductase required for mitochondrial amidoxime reductase activity (Neve et al., 2012). In this study, we provide evidence that CYB5R3 is the principal partner of the mARC system and is required for N-reductive metabolism in cells. Using small interfering RNA (siRNA)–mediated knockdown in human embryonic kidney (HEK)-293 cells and carefully evaluating knockdown efficiency with regard to knockdown effect, we show that very high knockdown efficiencies are necessary to observe an effect on N-reduction. Using complementary data gathered from stoichiometric in vitro studies and RNAi experiments in the cell system, we can now plausibly clarify ambiguous results from previous studies and identify CYB5R3 as essential for N-reductive metabolism in human cells. Unless otherwise stated, all chemicals were purchased from Sigma-Aldrich (Munich, Germany), Merck KGaA (Darmstadt, Germany), or Roth (Karlsruhe, Germany). Methanol (high-performance liquid chromatography grade) was from JT Baker (Deventer, Netherlands). HEK-293 cells were purchased from Cell Lines Service (Eppelheim, Germany). Minimum essential medium (MEM), Opti-MEM, sodium pyruvate solution, sodium bicarbonate solution, MEM nonessential amino acids, fetal bovine serum, trypsin, l-glutamine, phosphate-buffered saline, Lipofectamine RNAiMAX, the Stealth Select RNAi siRNA set of three oligonucleotides targeting human CYB5R3 (siRNA A: CYB5R3HSS141829; siRNA B: CYB5R3HSS176177; and siRNA C: CYB5R3HSS141830), and the Stealth Select RNAi siRNA negative control were obtained from Invitrogen (Carlsbad, CA). Complete protease inhibitor cocktail was acquired from Roche Applied Science (Mannheim, Germany). Anti-CYB5R3 was obtained from Sigma Life Science (St. Louis, MO) and anti-calnexin was from Acris Antibodies GmbH (Herford, Germany). HEK-293 cells were maintained in MEM supplemented with 10% fetal bovine serum, 2 mM l-glutamine, 0.1 mM nonessential amino acids, 1 mM sodium pyruvate, and 18 mM sodium bicarbonate. The cell line was incubated at 37°C in 5% CO2. siRNA Transfection and Design of Knockdown Experiments. HEK-293 cells were forward transfected and the CYB5R3 protein was downregulated as previously described (Plitzko et al., 2013). Three siRNA sequences to the target gene (siRNA A–C) were tested and optimal concentrations of each siRNA were evaluated. To optimize the time required for highest knockdown, effects were examined on different days after transfection. Negative controls included a nontargeting siRNA control (scrambled siRNA) and transfection reagents without siRNA. Downregulation of protein expression was verified by Western blot analysis. Cellular protein was harvested and protein contents were determined as previously described (Plitzko et al., 2015). SDS-PAGE and Western blot analysis to verify downregulation of CYB5R3 protein in HEK-293 were carried out as described previously (Plitzko et al., 2015). Densitometric measurements to analyze calnexin and CYB5R3 Western blot bands were conducted using ImageJ software (National Institutes of Health, Bethesda, MD) (Schneider et al., 2012). CYB5R3 levels were standardized by comparison with the calnexin loading control to account for any possible variations in protein loading. As a measurement of knockdown efficiency, relative expression levels were calculated by comparison with the negative control siRNA. Determination of N-Reductive Activity in Human Cell Lines. N-reductive activity in HEK-293 cells was determined by measuring reduction of the model substrate benzamidoxime to benzamidine as reported earlier (Plitzko et al., 2013). Expression and Purification of Recombinant Human Proteins. Expression and purification of mARC1 (reference sequence NP_073583), mARC2 (reference sequence NP_060368), CYB5B (reference sequence NP_085056), and CYB5R3 isoform 2 (reference sequence NP_015565) were performed according to Wahl et al. (2010). Determination of CYB5R FAD Content. The FAD content of human recombinant CYB5R was determined by absorption at 450 nm as previously described (Kotthaus et al., 2011). Determination of CYB5 Heme Content. The heme content of CYB5 was estimated by recording the difference spectrum of oxidized and NADH-reduced protein as previously described (Estabrook and Werringloer, 1978). Determination of Molybdenum Content in mARC. The molybdenum content of human recombinant mARC proteins was determined by inductively coupled mass spectrometry as described previously (Kotthaus et al., 2011). Stoichiometric Assessment in the In Vitro Reconstituted System. To determine stoichiometry, the Job plot method was modified by transforming a series of Job plots into a three-dimensional plot (Huang, 1982). Briefly, recombinant mARC, CYB5, and CYB5R were reconstituted in a system in which the total molar concentration of the proteins was kept constant. To determine the stoichiometry of the three components, the mARC concentration stayed fixed and the molar ratio between the electron transport proteins was varied. A series of these experiments with the same total molar concentration was conducted in which the mARC concentration was steadily varied. The N-reductive activity was then plotted in a three-dimensional plot against the ratio of CYB5 to CYB5R and mARC concentration. To determine N-reductive activity, reduction of the model substrate benzamidoxime to benzamidine was measured. Measurements were carried out as described previously with slight modifications (Kotthaus et al., 2011). The incubation mixtures contained 0.5 mM benzamidoxime, 0.005–544.5 pmol FAD of CYB5R, 0.005–544.5 pmol heme of CYB5, and 5–545 pmol molybdenum cofactor of mARC2 in 75 µl 20 mM 4-morpholineethanesulfonic acid, pH 6.0. The reaction was started with the addition of 1 mM NADH and stopped after 15 minutes by the addition of 75 µl ice-cold methanol. Samples were analyzed by high-performance liquid chromatography as described by Kotthaus et al. (2011). The reactions were conducted in duplicate and the results were reproduced with a different set of recombinant enzymes. Statistical analyses were carried out using SigmaPlot 11 software (Systat Software Inc., Chicago, IL). The significance of observed differences was evaluated by the unpaired t test and P < 0.05 was considered significant. All experimental values are reported as means ± S.D. 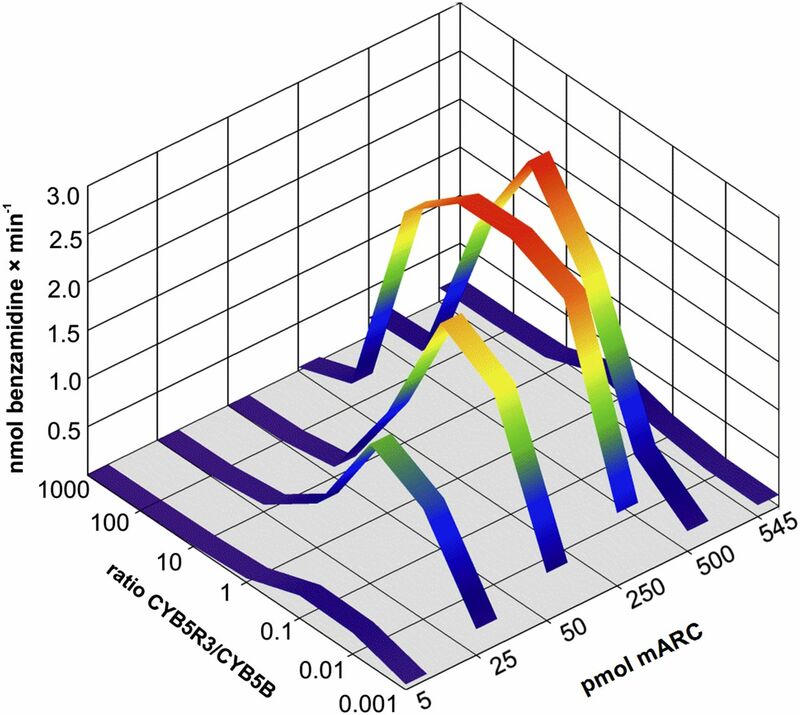 mARC is a molybdenum enzyme in mammals that interacts with the electron transport proteins CYB5B and its corresponding reductase to catalyze the reduction of N-hydroxylated compounds (Gruenewald et al., 2008; Havemeyer et al., 2010; Jakobs et al., 2014). Previous studies have demonstrated the involvement of the specific mARC and CYB5 isoforms. For the corresponding reductase, however, previous investigations have reported ambiguous results. Although the soluble form of CYB5R3, in concert with mARC and CYB5, can complete the reconstituted recombinant system in vitro, previous cellular studies have failed to provide compelling evidence for the involvement of any CYB5R isoform in vivo. Because of these ambiguous results, it remains uncertain whether CYB5R is the corresponding reductase and an essential part of the mARC enzyme system in vivo. In this study, we performed siRNA-mediated knockdown experiments with three different sequences targeting CYB5R3 and examined N-reductive metabolism in HEK-293 cells. Downregulation of the CYB5R3 protein level was achieved with all three siRNAs in a time- and dose-dependent manner (Fig. 1). Although the highest level of knockdown was reached between 3 and 5 days after transfection, the siRNAs showed immense differences in knockdown efficiency of the target protein. The decrease in N-reductive activity in cells was consistently observed with increased knockdown efficiency. Relative protein expression levels below 15%, achieved by transfection of the CYB5R3 siRNA A, resulted in a decrease of N-reductive activity by approximately 50% (Fig. 1A). Only moderate knockdown efficiencies were observed using the two other siRNAs. Depending on the level of protein remaining after knockdown, corresponding changes in N-reductive metabolism were very slight or absent (Fig. 1, B and C). These data indicate that significant effects on N-reductive metabolism in cells could only be observed with very high knockdown efficiencies, which resulted in nearly undetectable CYB5R3 protein levels. This suggests that only a minimal level of CYB5R3 protein is sufficient for N-reductive catalysis in cellular metabolism. These results are consistent with stoichiometric studies of the recombinant mARC system in vitro (Fig. 2). Optimal stoichiometry of the N-reductive system was determined to be 1:1:0.1 (mARC/CYB5/CYB5R). The highest activities were achieved with CYB5R/CYB5 ratios of 1:10, although ratios of 1:100 resulted in similar activities. Similar to our results from the cellular system, only very small amounts of CYB5R3 protein were sufficient for effective catalysis in the reconstituted system. N-reductive activity in HEK-293 cells after transfection of various siRNA sequences targeting CYB5R3. Transfection of siRNA A (A), siRNA B (B), and siRNA C (C). 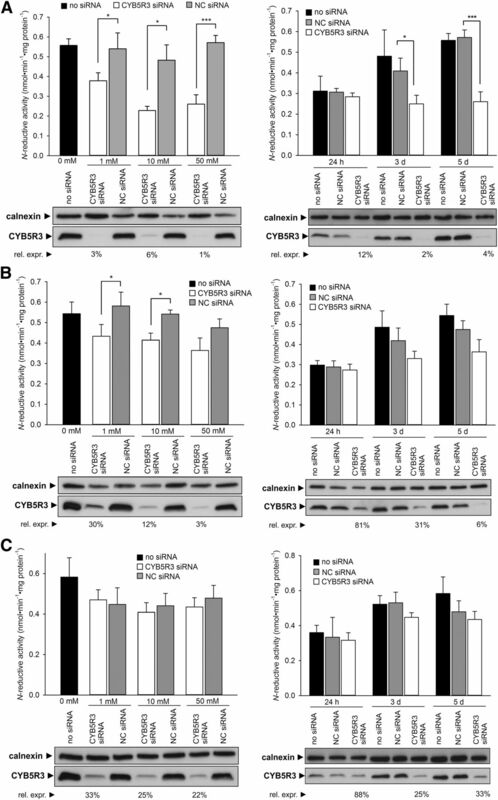 Effects of the concentration-dependent knockdown of CYB5R3 protein (5 days after transfection) and of the time-dependent knockdown (5 nM CYB5R3 siRNA or nontargeting siRNA [NC]) on N-reductive metabolism are presented. Results are displayed as means ± S.D. (n = 3). *P < 0.05; ***P < 0.001. The siRNA-mediated downregulation of the proteins of interest was verified by Western blot using anti-CYB5R3 or anti-calnexin (loading control). The calnexin and CYB5R3 Western blot bands were analyzed by densitometric measurements and the relative intensity is presented. Relative expressions levels (rel. expr.) in reference to nontargeting siRNA were calculated as a measure for knockdown efficiency. Stoichiometry of the three-component mARC system. A three-dimensional plot of N-reductive activity as a function of mARC concentration and CYB5R3/CYB5B ratio is presented. The total enzyme concentration was kept constant at 550 pmol cofactor in all reactions. Results are presented as the mean of duplicate reduction assays in which the concentration of the benzamidine product was analyzed twice each by high-performance liquid chromatography. Previous studies in mature murine adipocyte cells showed that downregulation of CYB5R3 did not alter N-reductive activity (Neve et al., 2012). Likewise, N-reductive metabolism was unaffected by the knockdown of CYB5R1 and CYB5R2. In a different approach, the selective CYB5R inhibitor 6-propyl-2-thiouracil (PTU) was unable to significantly inhibit N-reductive activity in the OMM fraction. Because Neve et al. (2012) were unable to confirm the involvement of CYB5R3, CYB5R1, or CYB5R2 in murine adipocytes, it was suggested that another unknown reductase was involved in the NADH-supported mitochondrial amidoxime reductase activity (Neve et al., 2012). Unlike our study, however, the transfection of a siRNA pool of four oligonucleotides resulted in a downregulation of CYB5R3 by only a maximum of 75% compared with the negative control protein level. Comparison of the knockdown efficiency between siRNA oligonucleotides is not possible because a siRNA pool was used. Our results provide evidence that CYB5R3 is an essential component of the mARC enzyme system and is pivotal for N-reductive metabolism in human cells. Only minimal amounts of CYB5R3 protein were sufficient to fulfill its function as an electron transport protein in the system, which is consistent with stoichiometric investigations in vitro. We have shown that a nearly complete depletion of protein was required in order to observe an effect on metabolism. Consequently, earlier studies showed no effect on N-reductive activity, presumably because of the moderate knockdown efficiency reported. Likewise, the described inability of the specific CYB5R inhibitor PTU to decrease N-reductive activity in the rat OMM fraction could well be attributed to insufficient inhibition (Neve et al., 2012). It was shown that PTU is able to inhibit the reduction of the artificial electron acceptor 2,6-dichlorophenolindophenol in rat liver microsomes with up to 90% efficiency (Neve et al., 2012). From this estimation in microsomes, however, a precise prediction of inhibitory efficiency in the OMM fraction, where the N-reductive enzyme system is located and with which N-reduction inhibition studies were carried out is difficult to be made. In contrast with PTU, the relatively specific CYB5R inhibitor p-hydroxymercuribenzoate was reported to effectively inhibit N-reductive activity in OMM and microsomal fractions (Andersson et al., 2005; Clement et al., 2005). Although it cannot be excluded that CYB5R1 or CYB5R2 are capable of catalyzing electron transport in the N-reductive system, given their minor expression compared with CYB5R3 (Wu et al., 2009) and the requirement of CYB5R3, they are not the primary reductases involved in N-reductive cell metabolism. This is supported by the finding that very efficient knockdown in murine adipocytes up to a nondetectable mRNA expression level did not alter N-reductive activity (Neve et al., 2012). Because the siRNA-mediated CYB5R3 knockdown approach has limited ability to completely deplete CYB5R3 protein, doubt remains regarding whether other reductases can also serve as electron donators (Neve et al., 2012); however, their in vivo relevance is expected to be low. On the basis of subfractionation studies with rat liver cells, Borgese et al. estimated that 40% of total CYB5R is located in mitochondria with an approximately equimolar CYB5R/CYB5B ratio (Borgese and Pietrini, 1986; D'Arrigo et al., 1993). Given the observation that a CYB5R3/CYB5B ratio of 1:100 can still mediate N-reductive activity with reasonable rates, the >95% CYB5R3 protein knockdown achieved in this study should result in a CYB5R3/CYB5B ratio that is very well expected to be responsible for the remaining 50% N-reductive activity observed. One would expect to observe no alteration in N-reductive activity even upon efficient knockdown of CYB5R3 if other reductases were involved significantly. In addition, the suggested importance of CYB5R3 for N-reductive metabolism is in agreement with the results of Kurian et al. (2004), who demonstrated that fibroblasts derived from a patient with type II hereditary methemoglobinemia (generalized CYB5R3 deficiency) showed virtually no N-reductive activity. To validate this finding, it would be intriguing to study more individuals with type II methemoglobinemia in greater detail. Taken together, our study defines CYB5R3 as the principal reductase involved in N-reductive metabolism in human cells and we are now able to present a model of the complete N-reductive three component system that consists of mARC1 and/or mARC2, mitochondrial CYB5B, and CYB5R3 (Fig. 3). Schematic of the components of the N-reductive system in human cells. The authors thank Petra Köster and Sven Wichmann (Christian-Albrechts University of Kiel, Kiel, Germany) for technical assistance and Patrick Videau (Oregon State University, Corvallis, OR) for critical reading of the manuscript. Participated in research design: Plitzko, Havemeyer, Clement. Contributed new reagents or analytic tools: Bork, Bittner, Mendel. Wrote or contributed to the writing of the manuscript: Plitzko, Clement. This research was supported by the Deutsche Forschungsgemeinschaft [Grants CL56/9-1 and ME 1266/24-1]. (2005) Characterization and partial purification of the rat and human enzyme systems active in the reduction of N-hydroxymelagatran and benzamidoxime. Drug Metab Dispos 33:570–578. (1993) NADH-cytochrome b5 reductase and cytochrome b5 isoforms as models for the study of post-translational targeting to the endoplasmic reticulum. FEBS Lett 325:70–75. (1986) Distribution of the integral membrane protein NADH-cytochrome b5 reductase in rat liver cells, studied with a quantitative radioimmunoblotting assay. Biochem J 239:393–403. (2005) Hepatic, extrahepatic, microsomal, and mitochondrial activation of the N-hydroxylated prodrugs benzamidoxime, guanoxabenz, and Ro 48-3656 ([[1-[(2s)-2-[[4-[(hydroxyamino)iminomethyl]benzoyl]amino]-1-oxopropyl]-4-piperidinyl]oxy]-acetic acid). Drug Metab Dispos 33:1740–1747. (1993) The specific subcellular localization of two isoforms of cytochrome b5 suggests novel targeting pathways. J Biol Chem 268:2802–2808. (1978) The measurement of difference spectra: application to the cytochromes of microsomes. Methods Enzymol 52:212–220. (2013) Activation of the anti-cancer agent upamostat by the mARC enzyme system. Xenobiotica 43:780–784. (2008) The fourth molybdenum containing enzyme mARC: cloning and involvement in the activation of N-hydroxylated prodrugs. J Med Chem 51:8173–8177. (2006) Identification of the missing component in the mitochondrial benzamidoxime prodrug-converting system as a novel molybdenum enzyme. J Biol Chem 281:34796–34802. (2010) Reduction of N-hydroxy-sulfonamides, including N-hydroxy-valdecoxib, by the molybdenum-containing enzyme mARC. Drug Metab Dispos 38:1917–1921. (2011) The fourth mammalian molybdenum enzyme mARC: current state of research. Drug Metab Rev 43:524–539. (1982) Determination of binding stoichiometry by the continuous variation method: the Job plot. Methods Enzymol 87:509–525. (2014) The mitochondrial amidoxime reducing component (mARC): involvement in metabolic reduction of N-oxides, oximes and N-hydroxyamidinohydrazones. ChemMedChem 9:2381–2387. (2012) The mitochondrial amidoxime-reducing component (mARC1) is a novel signal-anchored protein of the outer mitochondrial membrane. J Biol Chem 287:42795–42803. (2011) Reduction of N(ω)-hydroxy-L-arginine by the mitochondrial amidoxime reducing component (mARC). Biochem J 433:383–391. (2004) NADH cytochrome b5 reductase and cytochrome b5 catalyze the microsomal reduction of xenobiotic hydroxylamines and amidoximes in humans. J Pharmacol Exp Ther 311:1171–1178. (2012) Amidoxime reductase system containing cytochrome b5 type B (CYB5B) and MOSC2 is of importance for lipid synthesis in adipocyte mitochondria. J Biol Chem 287:6307–6317. (2014) Reduction of sulfamethoxazole hydroxylamine (SMX-HA) by the mitochondrial amidoxime reducing component (mARC). Chem Res Toxicol 27:1687–1695. (2015) The pivotal role of the mitochondrial amidoxime reducing component 2 in protecting human cells against apoptotic effects of the base analog N6-hydroxylaminopurine. J Biol Chem 290:10126–10135. (2013) The involvement of mitochondrial amidoxime reducing components 1 and 2 and mitochondrial cytochrome b5 in N-reductive metabolism in human cells. J Biol Chem 288:20228–20237. (2012) NIH Image to ImageJ: 25 years of image analysis. Nat Methods 9:671–675. (2010) Biochemical and spectroscopic characterization of the human mitochondrial amidoxime reducing components hmARC-1 and hmARC-2 suggests the existence of a new molybdenum enzyme family in eukaryotes. J Biol Chem 285:37847–37859. (2011) Phosphoproteome analysis of functional mitochondria isolated from resting human muscle reveals extensive phosphorylation of inner membrane protein complexes and enzymes. Mol Cell Proteomics 10:M110.000299. (2004) NCB5OR is a novel soluble NAD(P)H reductase localized in the endoplasmic reticulum. J Biol Chem 279:30316–30325.